Portovenere, at the western end of the Gulf of Poets, is one of the most evocative places in the Mediterranean area, which has always lived between legend and history, dream and reality. It’s difficult to describe with words this evocative place, rich in history, legend and provocative beauty, just like the goddess who gives it its name. 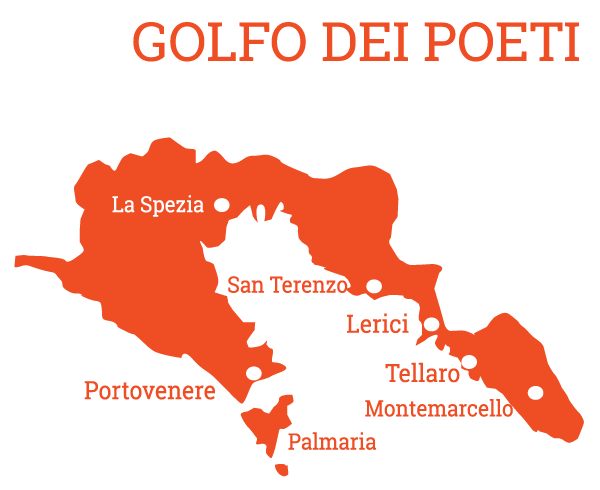 We could begin with the words of a great Ligurian writer, although not one of the many who have tried to describe Portovenere, or who chose it as a homeplace in the hope that it would give a bit of its beauty to their works. (…) all that can be imagines can be dreamed but even the most unexpected dream is a puzzle that hides a desire, or its reverse, a fear. Cities like dreams are built of desires and fears, even if the thread of their discourse is secret, their rules absurd, the perspectives deceptive, and everything thing hides another one. Perhaps Portovenere is a dream, made of fears and desires that live in the projection towards the infinite, in the architectures of defense, and in the alleys that weave a secret plot of surprising perspectives, different each time and explained only by an overall look of infinite beauty. By ferry: The ferry service provides a service to Portovenere only from La Spezia. Please visit our updated ferry schedule. By bus: buses to Portovenere from La Spezia are very frequent. By the majority of the stops of the city center, the P bus passes with a frequency of about 20 minutes, and it takes more or less the same time to get to the fishing villages. It is said that, where today stands the church of San Pietro, on the extreme tip of the coast, many centuries ago there was a Roman temple dedicated to Venus, the goddess of beauty and sexuality. According to the legend, she was born from the foam of the waves, and for the ancient Romans she was also propitiator of strength and victory. For this reason, many temples were dedicated to the goddess throughout the peninsula. Looking at the building of the present church of San Pietro, it is easy to imagine that those who originally conceived it felt the need to oppose the force of the earth to the energy of the waves, sometimes so large and powerful against that rocky shore. The stone of the temple does not seem almost a construction of man, it seems to rise from the ground to rise towards the sky, to look far, merging nature and artifact into a harmonious, strong, daring all. A small miracle of architecture that in the Christian era transformed the myth into devotion for the saint who was called upon to found the Church on a stone, and on his own courage. That’s how Venus became St. Peter in Portovenere.